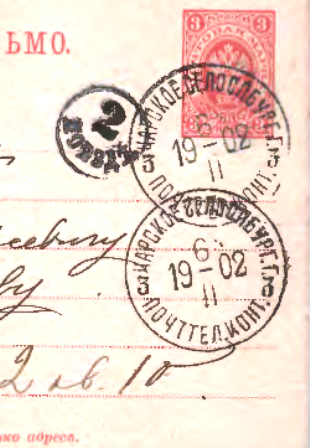 The Tsarskoe Selo, Warsaw, and Baltic railroads are known to have Poezd (train) and Pochta (post) marks between 1872-1904, and it was thought that they were used as sorting marks for specific trains. They are not TPO (Traveling Post Office) marks, because they were not applied on the train. It is thought that the black marks were for the trains traveling toward St. Petersburg and the traveling from St Petersburg. Thanks to the works of Manfred Dobin and Ian Baillie, the chart for these is shown in this exhibit. The exhibit will follow closely Mr. Baillie's classification chart which slightly altered the original chart of Mr. Dobin.